Gender inclusive restroom located on the ground floor. The Trembley Park Apartment Complex is located south of the University Center. 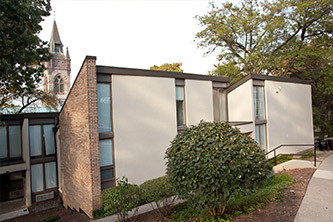 This seven-building undergraduate apartment complex is named in memory of Francis J. Trembley, Lehigh professor and pioneer ecologist. 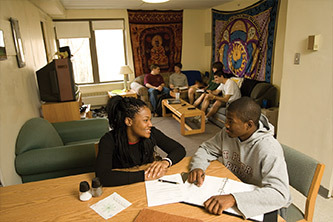 There are 196 upper-class students housed throughout the complex. 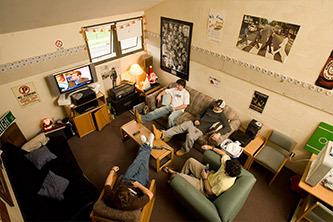 176 students reside in four-person apartments, each with a double and two single bedrooms, a kitchen, a furnished living room/dining area, and a private bathroom. Trembley Park also offers 20 individual suite single rooms. All are fully furnished, with a bathroom serving four residents. All apartments and suite singles are air-conditioned. Each bedroom is furnished with a bed, desk, desk chair, bookshelf, dresser and a wardrobe for each student. Kitchens in the apartments include major appliances such as a refrigerator/freezer, an oven, and a range. There is a kitchen table with four chairs in the dining area. The living room is furnished with a sofa, a lounge chair, a coffee table, an end table, and a TV stand. Laundry facilities and vending machines are located at Trembley Park #3 and #41 with a lounge in Trembley Park #41A.